With this Planner you can keep a record of your fast ,your Salah , your Dhikr and your good deeds and compare it every year . It has a Weekly evaluation Chart Where you can congratulate yourself for the good deeds you did and you can also write down your shortcomings . 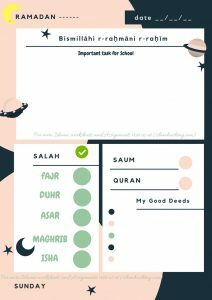 There are 3 Coloring Worksheet at the end of the Planner and a Salah chart which you can stick in your room and compare your Salah with that of your Sibling . You can Download it once and use it to Plan and Compare the Ramadan of your Child every year. It is a 45 Page journal for kids to plan their day ,their Salah ,their fast ,their good deeds and their task of the day during Ramadan.It has 3 coloring sheets , 30 Days Ramadan Planner , 4 Weekly evaluation and 2 Motivation Sheets .